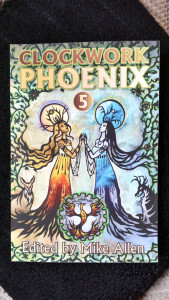 I was delighted to receive my contributor copy of Clockwork Phoenix 5 a couple of days ago. It is a stunning book, and I’m not just saying that because I’m (more than slightly) biased. It arrived at work, and a couple of my colleagues were driven to remark on how nice it felt — the print quality is excellent. Although I’ve had an electronic copy for a while, I’ve been saving the other stories for when the physical copy turned up, and so far Jason Kimble‘s The Wind At His Back indicates a fantastic collection. This book will be released on the 5th April, and can be pre-ordered direct here (same as first link above), or from Amazon US, Amazon UK, Barnes & Noble and a few other places. 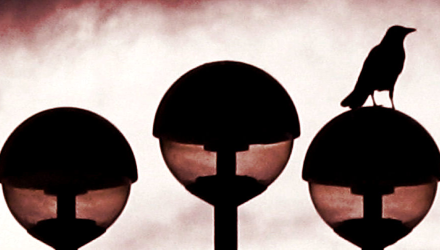 If you follow the first link in this post, you’ll find all the pre-order links. 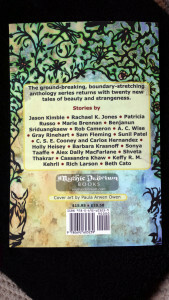 A Clockwork Phoenix 5 launch reading will take place on April 5th at 19:30 in The Brooklyn Commons Cafe at 388 Atlantic Avenue, Brooklyn, New York as part of the New York Review of Science Fiction/Hour of the Wolf Reading series. Mike Allen be there, and so will seven of the book’s 21 contributors: Rob Cameron, C. S. E. Cooney, Barbara Krasnoff, Carlos Hernandez, Sonya Taaffe, Shveta Thakrar, and A. C. Wise. 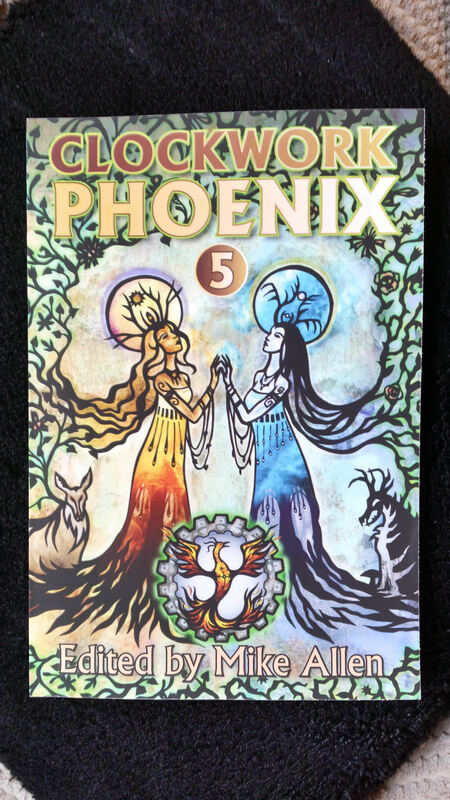 All will read excerpts from their Clockwork Phoenix 5 stories. I can’t make it, owing to the presence of a large, wet, wobbly thing in which one finds fishes and whales and crabs and octopuses. And, if you’re in book buying mood, Best of Apex Volume 1 is now in stock at Amazon UK, and presumably elsewhere. This book reprints my story from the December issue, She Gave Her Heart, He Took Her Marrow.